Goddess Matangi or Ucchisht Chandalini, the dark-colored Goddess, is one of the ten Mahavidyas in Hindu Tantric sect who is ferocious and rebels against the humanmade structures. Lord Shiva narrates Parvati, 108 names of Durga. Matangi is one of those names mentioned in Durga Saptashati. The seventh adhyaya (chapter) talks of slaying Chand and Mund (two demons). The section starts with paying obeisance to Goddess Matangi who sits on the jewel-studded throne listening to hymns in the sweet voice of parrots. The crescent moon adorns her forehead, and her one feet is seated on Lotus flower. She wears red color saree, and her skin is soft as honey. Her blouse covers her well-developed breasts. She plays veena and conch in her hands and wears a garland of flowers. The Madigas particularly worship her, a traditional shoemaking and community of leather workers in Andhra Pradesh, Telangana and Tamil Nadu region of India. Both Vaishnavites and Shaivaites Brahmins also worship her with great joy and respect. Gazetteer of the Nellore District: Brought Up to 1938, by Government Of Madras Staff, Government of Madras mentions about a unique local village festival, which usually provides an opportunity to step out of the social norms and expectations, a woman from the Madiga community, represents Goddess Matangi. She spits upon people assembled and touches them with a stick. The stick symbolizes snake here. Matangi can enter the house of any male member and touches men from all castes and classes. She plays the role of possessed Goddess and dances wildly, uses obscene language, drinks local country liquor and pushes people. The young woman may or may not be a celibate. Kinsley David in Hindu Goddesses writes, she roles her eyes intoxication and she reels about like an impassioned elephant. It is believed that her touch and saliva purifies the soul and the body. Here is a personification of Goddess who is wild and free-spirited breaking the caste and class boundaries. Emma Rauschenbusch – Clouch, (a Christian missionary who witnessed the conversion of Tribals to Christianity) in her book, While Sewing Sandals or Tales of a Telugu Pariah Tribe, writes about Matangi worship amongst the tribals in Southern India. She says Madigas call themselves Matangi Makkalu which means children of Matangi. She writes in detail about initiation of Madiga woman as Matangi, who is possessed by Ellama, who is considered AdiMata (mother Goddess who is there from the beginning and consort of Lord Vishnu). The story of Ellama is recited and the woman who would dance inspired and possessed by the Ellama is made the Matangi. The old Matangi initiates the new Matangi. There are many stories related to the origin of Goddess Matangi. Elaine Craddock, in Reconstructing the Split Goddess as Sakti in a Tamil Village in the book, Seeking Mahadevi, Constructing the Identities of the Hindu Great Goddess narrates an interesting story from Mahabharata regarding the origin of Matangi. In an ashram, lived the sage Jamadagni and his wife Renuka who was considered the most chaste woman. As a gift of chastity, she could collect water from the river without the help of a vessel. Once she saw a reflection of handsome Gandharva in the river water and was attracted to him. As a result, she lost her chastity. In a rage of anger, Jamadagni asks his son Parshuram, to kill his mother. Renuka runs and hides in the house of a washerwoman who tries to protect her from the wrath of her son and husband. Parshuram kills both the women and goes to his father. Parshuram asks his father to grant him a boon and requests to bring back his mother and the other woman back to life. In haste, Parshuram attaches the wrong head to the bodies. Renuka and washerwoman, both attain the status of Goddess. Renuka becomes Bavaniyamman and washerwoman becomes Matankiyamman. Emma Rauschenbusch – Clouch, in her book, While Sewing Sandals or Tales of a Telugu Pariah Tribe also lists few legends about Goddess Matangi. Once there lived a king Dundagheri and his wife, Jamila Devi. Once he was holding a court, a beautiful young woman appeared before him. She was an incarnation of Goddess Parvati. He wanted to catch the woman, but the woman disappeared into an anthill. The king ordered to dig the ground until they found the young woman. But the diggers found nothing. The king got angry, and at last, used his spear to pierce the skull of the woman. Blood started to ooze out from the head. The king and all his followers, went into an ecstatic mood as Goddess emerged out of the anthill in her full splendor and glory. She had a basket in her one hand and Adishesha (the great serpent ) in her another side. She had two plates one had blood, and on the other plate, she had her brain. She later married Jamadgani and had five sons. In the present times, Matangi smears the forehead of people with the red colored powder which symbolizes blood. Matangi worship demonstrates the closeness of people with nature and the divine mother Goddess. She is worshipped as a Tantric form of Saraswati, the Goddess of arts, music, wisdom, and knowledge. Temples for Goddess Matangi are located in Belgaum in Karnataka, Madanpalle in Chittore district in Andhra Pradesh, Nagaur in Tamil Nadu and Jhabua district in Madhya Pradesh. She is offered the leftover or stale food. She represents the exuberance in the feminine form who knows no boundaries of gender, caste, and class! 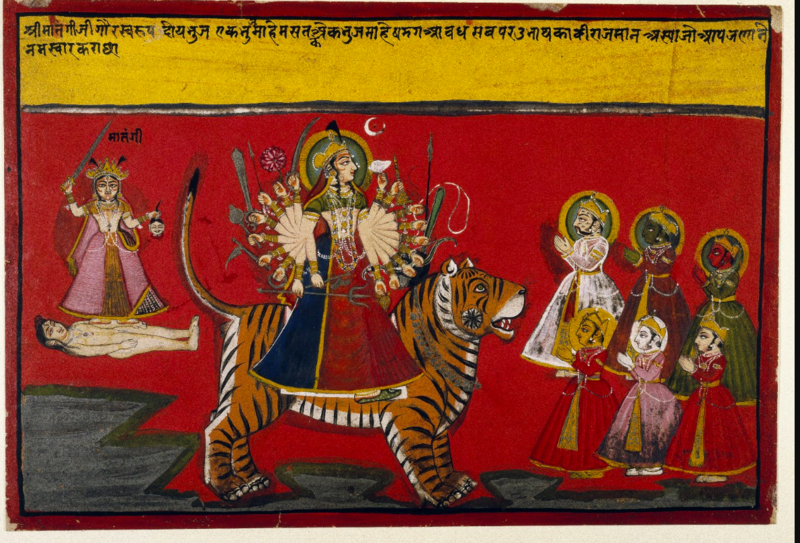 Pic: In this image, Durga rides on tiger, while her incarnation, Matangi, is shown at the upper left holding a severed head and a sword. Folk lore and puranic gods and goddesses have indeed connections. But I do not know many works on folklore goddesses. Good research! Its hard to find authentic sources of genesis of these!. I likeed the theme of ‘castelessness’ that runs throughout, with solid examples. Also, Happy independence day 🙂 Let us keep trying to make our country a better place and give meaning to the past sacrifices, in our own ways! Happy Independence day to you as well! You are lucky that you belong to a region which has a vibrant history and its still intact. Nothing remains of the part, to which I belong. I feel very sad that there is nothing that I can read about or refer to. We often not realise the worth of our own backyard. I did not know much of what you expressed, that is why I liked it more to know about my own backyard! Well, my parents were born and brought up in Delhi and so was I. We have no connections with any other part of India. I studied in Delhi so again lost out on the opportunity to explore other regions. But fortunately, my work took me to various areas of India and gave me the chance to look at different cultures. Though I had brief encounters, still it was eye-opening. May be you should write an article on your diversified “Encounters” and share your experiences (beauties, problems and solutions). If you have already written, can you direct me to that article? I have not written anything on that as yet. But yeah, I need to write all that before I die:-) and there is so much more to say. Hahaha… Lord Shiva and Lady Shipra again….!! Agree..we all should spend more time living than existing. Let’s see what all Aghori baba wants me to do. If he thinks I have something relevant and interesting to say, he will show me the path. As in your GURU or Lord SHIVA, the master Aghori? Either way, yes, our services will be requested at times when they are needed, than when we want to. 🙂 Lets see !! Lord Shiva, the ultimate Aghori. Agree totally, he will use it when he wants and the way in which he wants. U sure have such vastness of knowledge about human manifestation of the divine and their portrayal is so fearless…like it is said about one of the abhaymudra of Devi.. I stumbled on your blog looking for a picture, image of Matangi after getting the message intuitively that it was time to turn to Matangi again, I am an American, I grew up Catholic but was initiated into the Pagan Goddess ways when I was 18, that was 47 years ago. Over the years I have studied Goddess worship and her place in history, and society throughout all continents, every continent pretty much wiped her out except for India, for that I am deeply grateful to India and its people. In visiting the worship of the Great Goddesses of India, I read many books but David Frawley work helped me the most and I have worked with the Tantric Goddesses, Kali is core for me and Shiva but these are names, how we give names to the nameless. Anyhow, I just wanted to thank you for your blog, it has touched my heart sister, may I call you sister? Keep up the good work and spreading your thoughtful musing. Many thanks, my fellow Goddess sister. I started this blog with my head and heart full of questions after facing certain tough times over the last few years. Though I didn’t find answers, I am sure a lot calmer and content. For reasons known to Kali, I stopped writing two months ago. But your message today convinced me to write more frequently. I hope the formless divine will bless us all! If I may share the following, perhaps you are familiar already, if not based on what you are sharing through your blog I think you will find the following may fit in nicely. Good Reads: Around a 5,500-Year-Old Sumerian Literary Masterpiece: 1) Inanna, Queen of Heaven and Earth: Her Stories and Hymns from Sumer by Diane Wolkstein. 2) Descent to the Goddess: A Way of Initiation for Women by Sylvia Brinton Perera. 3) Beloved James Campbell and the Mythos Series; Mr Campbell was an anthropologist and authority on mythology, his life work is amazing and for many exposed to his work it often has had a profound experience, it did for me and still does. Thanks a ton! I did some quick research on your beautiful name after I received your message. In the coming days, will surely write about the daughter of the moon, Inanna.